At face value it might seem like the easiest thing in the world - you're just outlining shapes. But with time you'll come to understand that a high quality path is the result of a million tiny decisions made along the way. The analogy I like to use is that of a house painter taping off a house before starting with the paint. It’s time consuming, somewhat painful and certainly less satisfying than the actual painting. But if you don’t do it right you’ll be looking at considerable added time spent fixing up all the mistakes along the way, and you’re going end up with a visibly unfinished product. With a job of any complexity, that’s almost guaranteed. these shapes will be used to bring about change in an image, it will be impossible to produce a refined and useful set of clipping paths. Clipping - as we know it - cannot be done by robots. It also can’t be done by really smart monkeys. It can’t even really be done by smart people who don’t have experience and a good eye. We won't be replaced, for now. Mark my words and be sure to slap me as hard as you can if I'm wrong anytime soon. Again, it can’t be done by robots or smart monkeys. Because I’d really like it to. Not monkeys though, they belong in their native habitat. Clipping is the grand equalizer - in the scheme of retouching it is grunt work, digging ditches. But the seasoned veteran and noob both have to get their hands dirty and clip. Clipping is part of the cleanup process. While drawing a Path, an experienced Retoucher is thinking both micro and macro. While basically tracing the outline of something, you’re also thinking about how the shape will look as a whole. Especially in apparel and fashion, part of the beautification process is making a nice silhouette. In a garment, we want clean lines and smooth shapes, so while you Clip, you’ll be mindful of this and trim off any distracting or imperfect edge features.
. If you zoom in too far, you’re not going to have that bird’s eye view of the entire shape to make that idealize pass. If you zoom out too far, you’ll probably make some errors in placing the path along the edge carefully. So the key is to find a nice middle ground and zoom in and out as needed. : If you need to dramatically speed up your Clipping time, zoom out to 50% or more. You’ll be less accurate, but at higher zoom degrees it’s almost impossible to move fast. Where to place the Path along the edge also depends. If the element you’re clipping is going to go on a new background, it’s best to Clip a little inside the shape and trim off a little bit of the edge pixels. If the element is staying in situ, Clip along the transitional pixels. With practice these decisions will become second nature. Learning the Pen Tool is top priority, and the modifier keys. As you’re working, you’ll need to add and delete anchor points, move them, change them from curved to corner, and adjust the bezier handles. So learn what the Alt, Shift, Command, and Control keys do. Clipping is a physical practice that requires muscle memory and motor skills that can only be built through practice. The Paths palette is your library of the major shapes in the image. Start with the silhouette, often called Silo. Then add Paths that outline the shapes within it, starting a new Path for each shape and labeling it accordingly. It’s important to not repeat any Path edges during this process, instead building upon the previous Path you’ve made. The real science starts at the planning stage and ends when you use your Path library to create masks. With experience, you’ll learn to outline every element in your image without repeating any edges and output a set of layer masks by loading and subtracting Paths. Seriously. None of the automated tools (magnetic lasso, quick selection tool, magic wand) or channel mask tricks will be able to take you to a truly finished, commercial grade product as reliably. I have tested this time and again. When my lazy self takes over and says “this is a quick thing I need to mask, I can just rough it out with a brush with Quickmask on, don’t need to spend all that time clipping it out...”, I then cut to ten minutes later - the same damn time it would have taken to just draw out a clean path - where I’m still fussing with the edges of the janky little mask I created. I then curse, throw it away, and hit ‘P’. Now I know of at least one Retoucher out there saying right now “no way bro, not if you know how to do it…”. And he's right to a degree - in a deadline pinch where you have to mask out 75 curtains and comforters, ain't no way in hell you're going to clip them all. 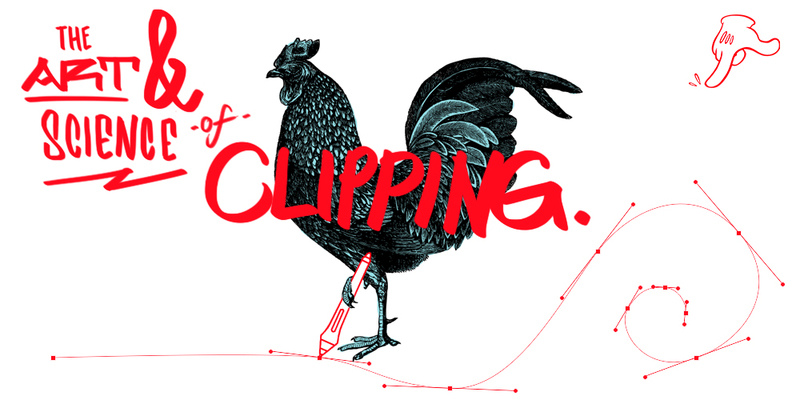 Do not expect to speed up a Clipping job dramatically by trying harder. Doing it right takes just about the same amount of time every time. Do not press your team to Clip faster. If you want a good Path, they really cannot. Clipping is physical. And draining. I don't have hard data - but if I had to guess I'd say it's the biggest contributor to Carpal Tunnel in this discipline. Seriously. I'm not kidding. If you are Clipping a lot, you need to pay attention to your posture, muscles, and breathing. It might sound strange but trust me, with a mindful approach to long periods of Clipping you can dramatically reduce your strain and fatigue. 2. Notice as you go along how your hand and arm will begin to tense. Practice relaxing them. 3. Pay attention to your breath - as you tense up and concentrate your breathing will become faster and more shallow. Breathe deep and slow. Return to these Zen Clipping tips regularly and find inner peace. Does Clipping drive you crazy? Do you have alternatives that work in a pinch? Have you got good results from outsourced Clipping? Are there any good tutorials for Clipping, or did you learn from a mentor?